Your kids or grandkids make every day enjoyable. Show off your the pride you feel with your own Property of My Kids Personalized T-Shirts. A perfect Father's Day Shirt for the Dad or Grandfather who is always on the go. Our Property of My Kids Personalized Shirt is available on our premium white 100% cotton Personalized T-Shirt, machine washable in adult sizes S-3XL. Also available in Ash Gray. Father's Day shirt includes FREE personalization! Personalize your Father's Day T-Shirt with any name, Choose Kids or Grandkids and any Department. (i.e. 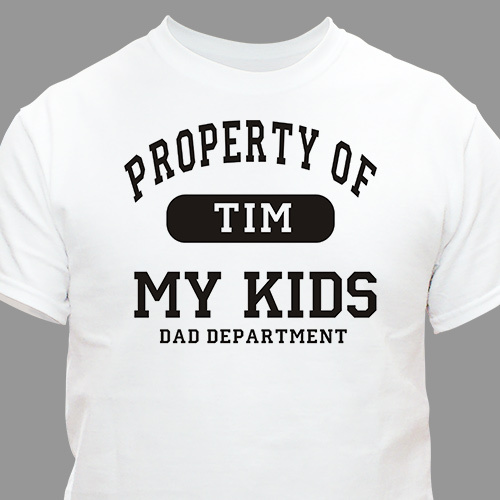 Tim\My Kids\Dad Department) Please specify color of text.